Less than three years after rebranding, Uber has rolled out a new logo and typeface called Uber Move that’s designed to evoke safety and accessibility. I guess Uber has gone all warm and fuzzy. After kicking Uber CEO Travis Kalanick to the curb, the company is driving to rebuild its reputation. The company has released ads with new CEO Dara Khosrowshahi riding an Uber to spur a fresh start. Now, with the help of global brand consultancy Wolff Olins at the wheel, Uber is shedding its rap for the iconography of Silicon Valley bravado. In the mist of Uber’s scandal-filled 2017, the powers that be came together to solve Uber’s biggest problem. Did they address their lack of diversity? Did they fix their internal culture? Did they establish a standard of business ethics? No. Uber focused on branding. Why of course! Why go through the hassle of fixing these minor inconveniences when you can slap a new logo on your service? 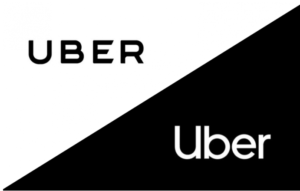 Uber discarded the assertive uppercase logo for an approachable lowercase logo. Still feeling iffy? If you look closely, the first letter isn’t a capitalized U. It’s actually a large lowercase U. Why might you ask? Because U matter! Uber’s friendly branding tactics will even make the biggest cynic forget about Operation Greyball. Just like Uber takes inspiration from their competitors, Uber found new inspiration from public transportation branding. Their app now includes certain shades of orange and brown to indicate important Uber information. Uber’s app also features a blue “safety” symbol that highlights “safe spaces” in the area. Sure, maybe Uber employees used their technology to stalk reporters and ex-girlfriends, but blue symbols make me feel safe. That’s ultimately what matters. Feeling. So when your company unleashes chaos throughout the nation, don’t panic. Just rebrand.